Canoe Ridge Creations: jackpot. katie jump rope. where you just want to scream jackpot at the top of your lungs? Well today, I yelled KATIE JUMP ROPE! Today, I spent some quality girl time with my mom and sister shopping. We had a few things on our list, prom dress fabric for my sister, a new camera for me (more on those later), and my mom needed to stop at a LQS. Once a month, her and a group of friends are involved in a monthly sewing club and she needed to catch up on the patterns. I had only been to the store once and it had been a few years, so I was very excited to go along. Ladies, I walked in and started hyperventilating. Literally. 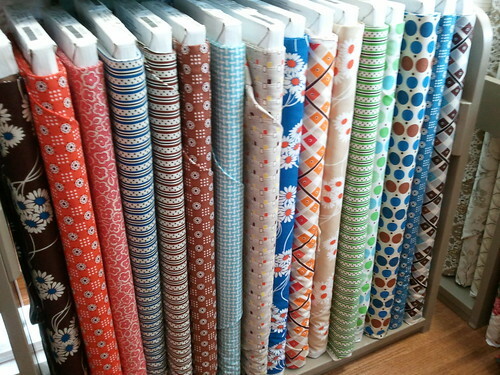 There was Amy Butler, Anna Maria Horner, Far Far Away, Kona Solids, so much awesome fabric! I couldn't concentrate. And then, I met Katie Jump Rope. Eeeek. I am still shaking! Now I missed out on this line when it first came out and have awed over it ever since. They had yardage (pictured above) and I landed my hands on the last FQ set, which will made into a Single Girl Quilt soon. Ah! When I found it I just wanted to scream and tell someone. My sister and mom had a hard time understanding my excitement. My boyfriend tried his best sharing my excitement when I called him. But it just wasn't the same. I wanted to rush home and blog about it, because you all can relate. You all know what it is like to find some great quilting fabric. And you all know how exciting it is when you hit the jackpot! I had the same reaction when I found it in a 200 mile away LQS last weekend. The shop I was in dot + stripes in stock. I didn't mind. Good for you for finding this.. So fun! Awesome find! I started collecting after it was cool too. Care to share your source? I only have half of the prints in the picture. Whoohooohooo!! It's the best feeling to find what makes your heart pitter patter! Can't wait to see what you make with it! Oohhh!!! Awesome score! Do they have an online shop? I'd love to get my hands on some of that. What a find!! I wish this was my lqs!! Mine sadly is run by a lady who doesn't quilt or even sew for that matter. Very frustrating! I'm right in the middle of Iowa and so thankful for the internet!! So where is this quilt store? You have to share!!! Holy moly, what an awesome find!!! I wish my LQS had some of this, I would love to have a few of those!!! I'm palpatating for you! Yay! Wow, that's so crazy!! I can't even believe it! Are you doing the Single Girl support group that starts tomorrow? Oh, very nice find! This will make an awesome single girl quilt!! Amazing!!!!! I am breathing heavy myself right now! I bought some bits and pieces after the fact, but missed out on the original release as well, and to see it all together in its glory like that....I want more!! Where is this store??? I want to call them and have some sent to me! This will rock as a single girl quilt! You go girl! Hello Megan! I'm sooooo happy for you and your Jackpot!!! I understand you more than well...or perhaps not at all because I can't find here any jackpots... so I'm even more happy for you!!! But so often I have those aaaahhh - ooooh feelings when seeing your beautiful fabrics! Hahaha, I know *exactly* what you mean. When I see yardage from an older much-beloved line, my heart starts to pound, and my palms get all sweaty, especially if it's on sale.